Rain, snow, and more rain seem to be the norm in Vancouver these days, and along with all that precipitation comes a deluge of Hunters, Tretorns, and brightly patterned rainboots. After the torrential downpours of late, I'm finally throwing in the towel: I need rainboots too. Tall leather boots just won't do for the "Noah, get your ark" sort of days. Now, I have nothing against Hunters and the people who choose to wear them. But after spying the fifth pair of Hunters in as many blocks walking down Robson, they begin to lose their special appeal. My Holy Grail rainboots would be classic, feminine, and versatile with visually interesting details that set them apart from the sea of more common rainboots. With that in mind, I met gorgeous blogger and friend Carolina to try on Chanel rainboots one lunch hour. The shiny patent-like surface of these camellia-adorned beauties is gorgeous, as far away from the funny-smelling patterned rubber used to make cheap rainboots as you can imagine. Carolina ended up getting the red ones while I put myself on the waitlist for the black ones with the white camellia and sole. Deep down though, doubts still lingered. The boots were so colourless and my winter coat was black (the other one was black-and-white plaid). Did I really want my head-to-toe outerwear look to be so monochromatic? The red Chanel boots would've been perfect (red is bright yet as versatile as most neutrals), but they didn't have any left in my size. Then while browsing Piperlime, I saw the Kate Spade 'Randi' rainboot ($125 US) and my heart gave a funny lurch. That shiny patent-like surface! The red bow and heel providing the perfect accent of colour! I was in love. The use of colour contrast is similar to the Chanel pair but these Kate Spade boots can stand on their own design-wise. And at $125, the price is comparable to a standard pair of Hunters and considerably less than the Chanels. They've been ordered; I can't wait until they arrive. Find feminine, classic, versatile alternative to Hunters? Mission accomplished. P.S. 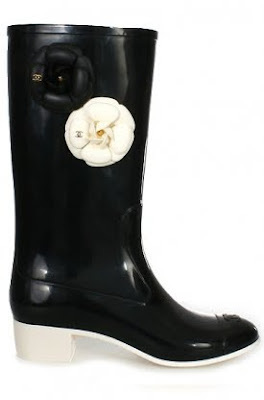 For those on a similar quest to mine, consider the leather-trimmed Tory Burch buckle rainboot ($225 US). I love how they combine design elements from duck boots and riding boots, and the leather details make them look much more luxe than your run-of-the-mill rainboots. UPDATE [November 28,2011]: Well, that was a bust. After less than a year--a very blissful year--with my Kate Spade rain boots, I was less than happy to find that the rubber was cracking at the ankle. Talk about shoddy quality! The search is on for a replacement pair. I would never spend much money on a pair of rainboots. Eg, Hunter ones are cheap and amazing, even Kate Moss prefers them! I wouldn't really wear rubber boots unless I'm taking my dog to the park. I find that good quality leather boots do the trick on the pavement. I just don't find them worth the money so I'm glad you went with the cheaper Kate Spade option. But for the dog park, the Tory Burch boot is certainly more stylish than my Tretrons... Hmmm. Love your Kate Spade scores! SO feminine! And those Tory Burch beauties...Be still my heart! 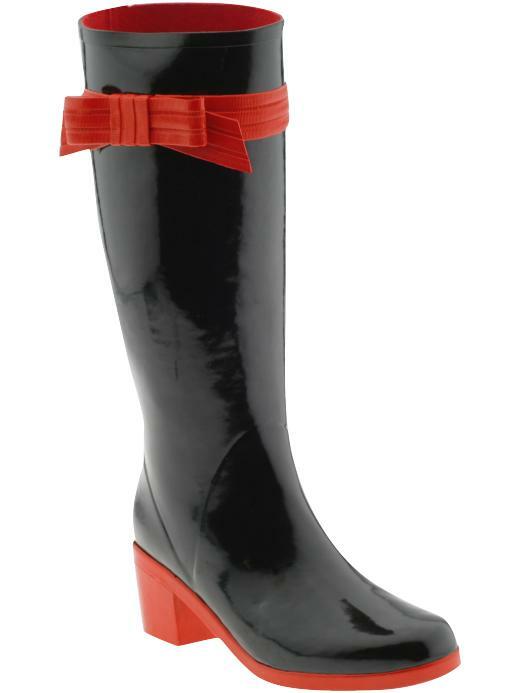 I'm usually not a fan of rainboots, but these are adorable! I'm a big fan of the Aigle Ecuyer boots. They're really sleek and simple-plus they look like leather. 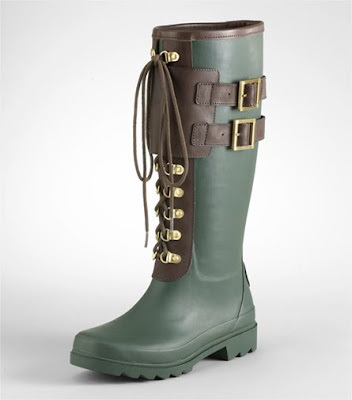 I like that they don't gape at the top like most rainboots do, and they come all the way up to my knee. I love those Kate Spade ones though-the heel is a really cute detail. How much were the Chanel ones? Ooooh... love those rugged ones. Though I must admit, I'm a Hunter girl myself. I love the second pair of boots with the bow. Although I'd like the color scheme to be ivory and black like the first pair. : ) An ivory bow! lol anyway, yea I didn't get a pair of hunter boots either but I did get a look alike pair in solid black with a little buckle on the side. I think I would love to have a dressier pair of rainboots too. Another pair I have are blak and white plaid. Btw, what's your take on rainboots lined with fur on the inside? Is it practical? Oooh! I like the Kate Spade boots!! The red bow detail is adorable! As much as I like the Chanel boots, I think you made a good choice here. Those Kate Spades are beautiful and cute - still versatile, but also with a punch of color. They have my vote! ps- Lurve your Kate Spades! The Kate Spade is nice for a little color!